There are cooking methods incompatible with my desire to keep the kitchen clean. Deep frying is one and searing, at blisteringly proper temps, is another. They need to step outside. 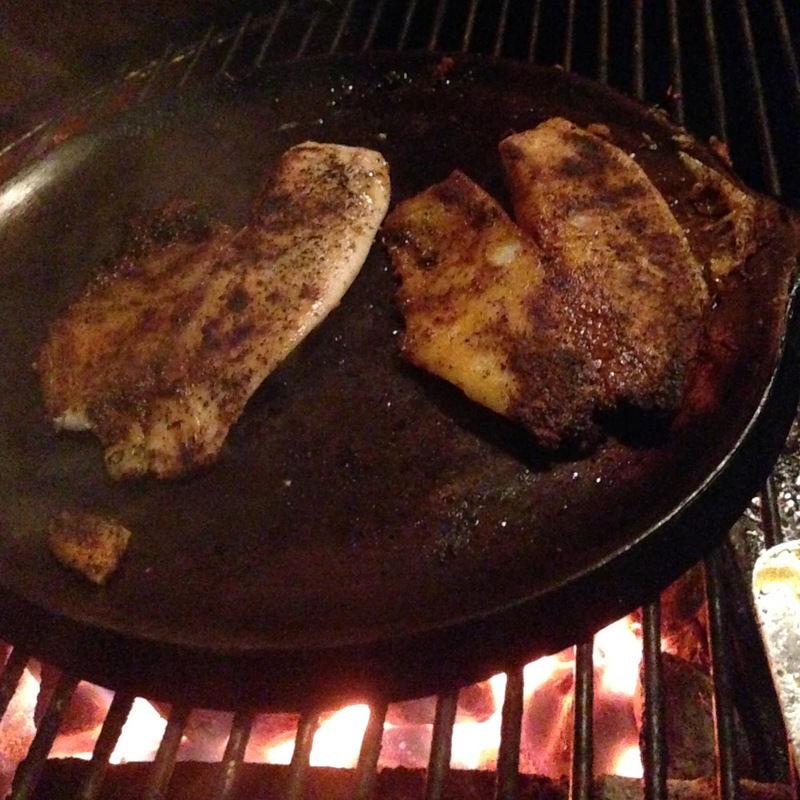 Last night I wanted to sear/blacken some tilapia for fish tacos. My usual prep is to cover both sides of the fish with salt, pepper and paprika. * I let them sit prepped at room temp a while and preheated the pan. I use my grill most often as a smoker I also use it for a simple hot surface for fast searing (and flatbreads). It's pretty simple and fast enough for a weeknight dinner. I use a small pile (ca. 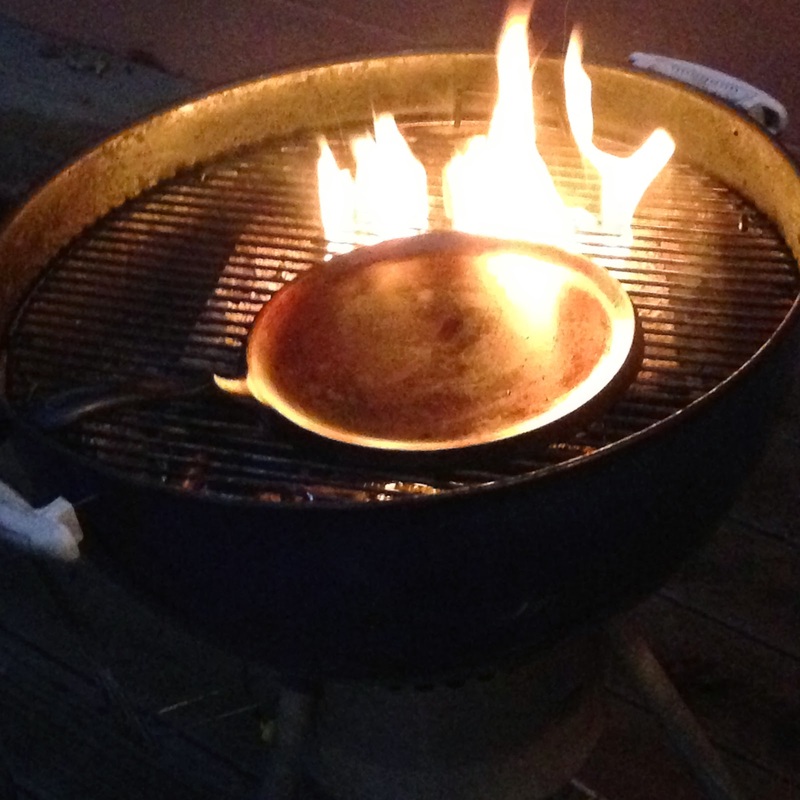 2 lbs) of Matchlight briquettes; light 'em and stick a cast iron pan on top while they light. Vents on the bottom of the kettle should be full open no cover. One time I place a perforated aluminum sheet on top of this flame, the ones used to cook vegetables, and it disintegrated. Matchlight is intense. If properly lit, there is zero detectable "lighter fluid smell," at this temp, it's impossible. When the flames die down and the coals are red hot, you're ready to cook. No need to measure the surface temp of the pan, I just measured to put a number down for this post. This is a couple filets after a minute on each side. *The paprika should not be the pathetic stuff from that little red can. If it's from an Indian grocery store, should be fine.